Kate (@kateflatman) and her little ones headed to SEA LIFE Melbourne Aquarium this week for a fun morning to enjoy the Aquarium and take part in the PAW Patrol SEA Patrol pups adventure. 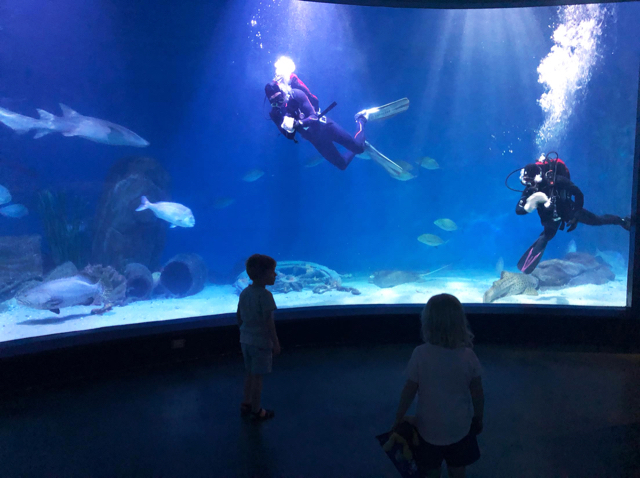 The interactive experience will take families on a PAWsome underwater quest throughout the SEA Life Melbourne Aquarium to help find the missing PAW Patrol pups and save the day. No job is too big, no pup is too small! The PAW Patrol underwater adventure is included with all SEA LIFE Melbourne admission tickets and upon admission children receive a PAW Patrol Pup Pack with wearable puppy ears, a treasure hunt map and five PAW Patrol stickers to use to complete the treasure hunt. The race is then on to follow the map (and the paw prints!) and find all of the PAW Patrol SEA Patrol pups who are hiding throughout SEA LIFE Melbourne. Kate's poppets liked seeing which pup they would find next and taking turns guessing and posing in front of each pup. Lots of cute photo opportunities! Once Kate's little ones have completed their treasure map, they showed it to the gift shop desk to receive a full Paw Patrol sticker sheet for them to keep. There is also limited Paw Patrol merchandise at the gift shop for Paw Patrol lovers. A great morning at the Sea Life Melbourne Aquarium! The Sea Life Melbourne’s PAW Patrol SEA Patrol experience is on until Monday 30th April 2018. For more information, head to the SEA LIFE Melbourne website. Busy City Kids were invited to the Sea Life Melbourne for the purposes of a review of Paw Patrol Sea Patrol. All opinions & feedback are genuine & truthful. Travel and fee paying activities were self funded.